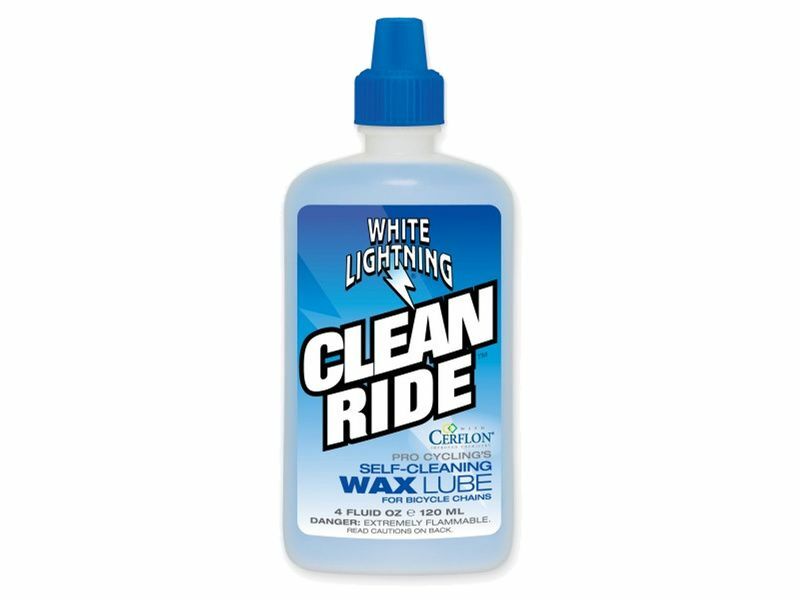 The White Lightening Clean Ride lubricant sets up as a dry wax film. There is no oily film to attract abrasive contaminants, so your chain and gears will perform better and last 2 to 3 times longer. Clean Ride's self-cleaning action is activated by any dirt, grit or grime that finds it's way onto your chain or parts. Small particles of the outer wax structure will flake off, taking the dirt, grime or grit with it. This begins the cycle of 'self-cleaning'. Clean Ride is a unique, wax-based lubricant, so it is important to start with a clean chain. For optimum 'self-cleaning' performance, do not mix Clean Ride with oil based lubricants. The dirtier the ride, the more active the shedding action. So to this extent, Clean Ride will require more frequent re-application after dirtier rides. When Clean Ride is used regularly and properly, you'll rarely have to clean your chain again. So, while your buddies are cleaning their chains, you'll be applying a fresh shot of Clean Ride and heading out for yet another great ride!